Fed hiking rates. Take advantage of higher savings ratesThe yield curve is a curve on a graph in which the yield of fixed-interest securities is plotted against the length of time they have to run to maturity. A yield curve is almost always upward sloping, a sign that the economy is functioning properly. To best understand the yield curve, put yourself in the shoes of the lender, the borrower, and the investor. Each entity is rational and looking to do what’s best for their bottom line. Due to inflation, the value of a dollar tomorrow is worth less than the value of a dollar today. Therefore, in order to profitably lend money, you must charge an interest rate. The longer the lending term, the higher the interest you should charge, hence the upward slope of the yield curve. If the borrower has a poor credit score, runs an unstable business, has large job gaps in his resume, doesn’t read Financial Samurai, or doesn’t have many assets, then you need to charge an even higher rate to account for credit risk. If you can get a borrower to pay back an interest rate higher than your competition, you’re making superior economic returns. If you are a bank, your main source of funding is from saving deposits. For the privilege of holding such deposits, you pay customers an interest rate and hope to lend out their deposits at a higher interest rate for a positive net interest margin. If the yield curve is upward sloping, banks have an easier time achieving such profitability. A rational borrower is incentivized to: 1) borrow as much money, 2) for as long a period of time, 3) at the lowest interest rate possible to get rich. The more you borrow, the more you will likely invest. When the borrowing rate is equal to or below the inflation rate, a borrower is essentially getting a free loan. The classic borrower example is the homebuyer. After putting down 20%, the buyer borrows the remaining 80%. The lower the interest rate, the more inclined the borrower is to take on more debt to buy a bigger, fancier house. When homebuyers want to stretch, they take out short-term adjustable rate mortgages (ARM) with lower interest rates versus 30-year fixed loans with higher rates. In a declining interest rate environment, taking out an ARM is an optimal move. In addition to homebuyers, there are companies large and small, that borrow money to grow their respective businesses. If interest rates are lower at every duration, businesses will tend to borrow more, invest more, hire more, and consequently boost GDP growth. The Investment part of the GDP equation: Y = Consumer Spending + Investment + Government Spending + Net Exports is vital. Given the motivations of the borrower and the lender, the investor sees the yield curve as an economic indicator. The steeper the yield curve up to a point, the healthier the economy. The flatter the yield curve, the more cause for concern given the borrower’s doubt about the near future. If there is a lack of demand for short-term bonds, pushing short-term yields higher, perhaps there is doubt about short-term economic growth. Similarly, if investor demand for long-term bonds keeps long-term yields low, this may mean investors don’t believe there are inflationary pressures because the economy isn’t viewed as trending stronger. Short-term yields are also artificially pushed up by the Federal Reserve since the Fed Funds rate is the overnight lending rate – the shortest of the short. An investor needs to make a calculated guess as to how often and how aggressively the Federal Reserve will raise its Fed Funds rate and how the bond market will react to such moves. The bond investor wins if inflation comes in below expectations. Inflation comes in below expectations when economic growth comes in below expectations. The stock investor wins if economic growth comes in above expectations, generating stronger corporate earnings growth, while interest rates remain at a level high enough to contain faster-than-expected inflation while not choking off investment growth. Take a look at the yield curve today versus the yield curve in 2017 and 2016. It’s clear the yield curve has flattened as short-term rates have risen faster than long-term rates. If the Fed raises the Fed Fund rate by another 0.5% in the next 12 months the yield curve will be completely flat if not inverted by 2019 if long-term rates stay the same. With a flat yield curve, you are disinclined to lend money over a long duration because the return is too low relative to the short-end. As a result, you tighten up lending standards and lend to only the most creditworthy people. You’d rather lend money for as short a time as possible because the interest rate you can receive is similar to the long-end. A shorter lending time horizon is also less risky than a longer time horizon. Unfortunately, borrowers think exactly the opposite. Borrowers are less inclined to borrow capital short-term if the interest rate is very similar to long-term interest rates. They’d rather borrow at the same rate for a longer time period, but are often shut out due to more stringent lending standards. If the yield curve inverts, i.e. when short-term interest rates are higher than long-term interest rates, the rational borrower slows or stops his borrowing. Only the most desperate (least creditworthy) borrower takes out a short-term loan at a higher interest rate (e.g. credit card and loan shark borrowers). This ultimately ends up hurting both the lender and the economy long-term due to higher default rates. A cascade of defaults by overstretched mortgage debtors is exactly what took the housing market down between 2007-2010. There will eventually be an interest rate inflection point where the borrower not only stops borrowing, but starts saving more. With borrowers saving more, investment, by definition slows down. Multiply this action across millions of people throughout the country and the economy will turn south. In economics and finance, everything is rational long term. Investors take action to enrich themselves, while doing their best to avoid actions that will make them poor. Take a look at the chart above. 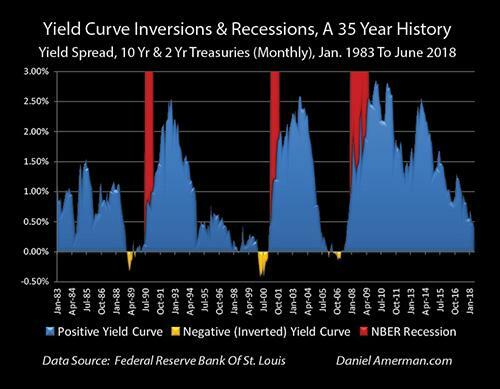 Within a couple years of the yield curve inverting (yellow), a recession ensued. Each time a recession ensued, the stock market took a dive. 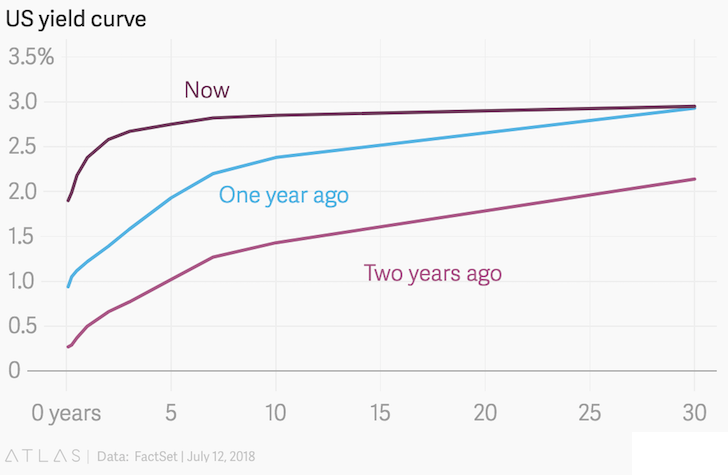 The tricky part is not forecasting if a recession will happen once the yield curve inverts. The tricky part is forecasting when the recession will happen. If the Fed raises its Fed Funds rate by more than 50 basis points over the next 12 months, the yield curve will most likely be inverted as I’m of the belief long bond yields stay flat. Therefore, the logical conclusion based on history is that a recession will arrive by 2020. Of course long bond yields can rise to prevent the inversion, but higher rates slow down economic growth. Therefore, either way, strong head winds are coming. Yes, banks have taken measures to shore up their balance sheets and tighten lending standards since the last recession. But we cannot underestimate greed or the stubbornness of the Fed to over-tighten to prevent inflation from getting out of control. Everyone should be paying attention to a flattening yield curve and take precautionary measures to protect their wealth. It’s much better to be a little too early protecting yourself than a little too late. Check out CIT Bank’s 2.45% money market rate. This is the best rate I’ve seen in a long time to optimize your cash. Readers, do you think this time time will be different? Will the long end of the yield curve begin to steepen as investors sell off safe assets for riskier assets? When do you think the Fed will stop tightening? When do you think the next recession will arrive? First time poster here, I recently discovered your blog and have been gobbling up all the information. I really like the way you simplify things so a non-financial reader like me can grasp it. Now to my question, I have been wrestling with this decision for a while now and any insight would help. We live in south bay, Milpitas specifically. We own a town home as our primary residence and the property value has almost doubled since I bought it in 2010 (~500K in gains, right at the limit of tax free capital gains). I see a lot of condos and town homes popping up everywhere (few thousand units in the last few years and still more construction ongoing), but I also see the area growing with the BART stations, new schools and shopping malls. 1) Sell the primary residence at the current highs, rent until the market cools down and buy a single family home. 2) Stay in the current primary residence until the market cools down, buy a single family home and make the current residence as a rental property. The X factors are, if I sell the house now, I`m not sure how long I will need to rent. Also my HOA came up with a recent assessment of $25K/unit for fixing some exterior stuff (which is not much in long run). I think you’ll still come out ahead with a 5/1 ARM. I don’t see the long bond yield going up much more than 0.5%, hence the flattening yield curve. I’m assuming you have more money now than then, too. Aaah, thanks for reminding me of the big picture. I was thinking of monthly payment going up, but you’re right, look at it all. Since that day in Feb 2016 that I closed on current house (when I had to pull downpayment out of the market at a loss due to the low point then), my total investments have doubled. 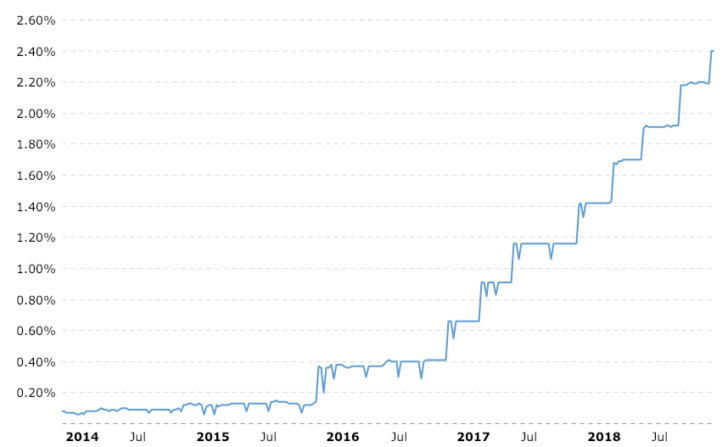 Most of that is investment earnings or deposits I made since then, and 15% of my current worth is from money on the house I sold in Florida that came in Apr 2016 (and unfotunately, which I didn’t invest that well, but it’s made some money). Sam-great post. Question: come next April 15, what impact will the loss of the SALT deduction have on coastal real estate and economies? I think it may be what helps trigger local and then national slowdown. But for some reason the media has paid no attention to what I believe will be a shock to many blue state homeowners and a corresponding shock to the real estate market and economy. I definitely think next year’s taxes will be a big shock to coastal city residents. Nobody really feels anything until that happens, because people don’t properly plan. I think there there is a case to be made why this time things may be different. When you look at the long end up the yield curve it’s effectively pegged to the 10Y UST. The reason I think things are different this time around, is what’s keeping the long end down. It’s not the expectation that there will be a large abrupt dislocation in the market, or that the economy will stop growing, or that inflation will be zero. It’s down because the world is buying up bidding up treasuries on the secondary. The problem as I see it is that the major economies of the world are still pursuing a quantitative easing policy. The Japanese and the Europeans are still dovish. On a risk adjusted basis, the UST offers superior returns to any other sovereign. Japanese yields have been hovering around 0 for last 2 decades. As for Europe, Bunds are at negative to zero on one end of the credit spectrum and on the other end Greek debt is tightened to around ~3.8%. With the 10Y UST at floating between 2.8%-2.9% it’s one of the best deals out there. If you wanted to buy full faith and credit, there is really only one place to put your money. If you want further indirect evidence just look at the exchange rates. The dollar is just getting stronger as people keep bidding up the USD to buy USD assets. Just my two cents. Hence why the long-bond will stay low IMO since we are a relatively good deal globally. But, eventually, when the spread between US yields and global yields widen too much, we will be at a tremendous disadvantage and become uncompetitive. Then the Net Export part of the GDP equation suffers, and so will the other variables until Government Spending gets pumped up again. What you describe is a vector in the markets, but there’s also de-dollarization occurring as well. Ever since the eurodollar markets broke in 2007, the SCO bloc has been busy cobbling together an alternative financial system. The fact Russia has dropped the list of top foreign holders of UST’s is a big tell in my opinion. And come September the first if the Shanghai oil contracts are to be settled. The volume on the Shanghai Energy Exchange has far exceeded my expectations. I thought it would take more time to get to where it’s at now. To make sense of what Trump is doing all you have to do is look thru the lens of extracting America from the burden of issuing the global currency. The military/intelligence faction behind Trump wants to take the country where JFK wanted. I think de-dollarization of the world it not practical or beneficial for anyone at the moment. Things can change but if you think through the most fundamental thing that needs to happen it becomes come more and more remote. To de-dollarize, you need to find another currency that will be universally accepted. The next best thing is the Euro which is a very carefully managed currency and even the Euro has doubters amongst the European nations that use it. In my previous life, I structured numerous fixed income transaction denominated in EUR and GBP, and all of them contain a clause to contemplate the possibility that the EUR and GBP will ceases to exist at any point before the termination of the transaction. Once you leave the euro and sterling, your runner ups are the CNY, RUB and JPY. None of those are ideal currencies for use in global trade. At the end of the day, the position of global currency will be held by the nation that has the strongest economy,the strongest military and the the most stable government. Of course history has taught me the status of being a global currency is impermanent. There was a time when Spain and Portugal were both the global currency. So I don’t disagree that the world is trying to de-dollarize, its just that i don’t see it happening anytime soon. Great post, and like a few others have mentioned, this is the first breakdown of the yield curve that I have actually grasped. However, what is your opinion on the fed discarding the yield curve as a predictor of a recession based on their last meeting? Here is an article describing why the fed doesn’t think the yield curve is no longer a good predictor of an upcoming recession. Can you please let us know what you think of this? The Fed uses moral suasion. They can’t telegraph exactly what they think, otherwise, markets will arbitrage immediately with often violent results. Why do you think nobody could fully comprehend what Alan Greenspan was saying? Wow Sam this blog is real and timely. Thanks! What’s your expected drop in 2019? It’s true we’ve been drunk in cheap credits, both short term thru Fed engineering, and long term thru Fed QE2 and China buying our long bonds. Since both sources are drying up now, it looks like not only yield curve is flattening, but also going up on both short and long end. This past week we looked at a few SF real-estates as potential investments, current prices can no longer justify given the rental incomes. i.e. cap rate is much lower than mortgage interests + HOA + property tax (even if financing is only 80%, not 100% we’d have negative carry). 1-bedroom condos prices are dropping because it’s primarily an investor market. Current price level only makes sense for people who want to live in SF for 5-7 years, so their ownership cost is lower than rent only because tax deductions. In outer markets like east bay, the rent is dropping, which is alarming because normally the job market should keep the rent stable, but thanks for over-building and soft job markets we’re not able to raise rents without losing tenants. But is the current yield curve indicative of a severe recession, or a mild one? In 2008 the real culprit was sub-prime lending and resulted in a huge recession. In 2000 there was dotcom bubble. This time there’s no bubble (or I failed to see one?) Maybe the high flying stocks and real-estate will flatten or drop 10-20%, but consider S&P went down 40% during 2008, maybe a 10-20% correction wouldn’t be so bad? Not sure. For the SF Bay Area economy, I see a mild recession with corrections in the 15% – 20% range. For outer lying areas, 30% – 40%. Our economy has so many massive companies with huge balance sheets. Hard to see a hard landing. But property prices and rents are definitely weakening. It is obvious for anybody looking and searching. It’s weird why the media doesn’t highlight this more, and just highlights more hype. This is an excellent commentary. Anybody have an opinion of this Qanon? I’m torn. I can’t tell if it’s for real or a bunch of internet opportunists trying to monetize on the Fourth Turning. I love your crazy comments. They are so enlightening and strange because they literally make no sense and have no point. Keep it up! I was in business school in early 2008 and taking a course by famed economist/professor Zvi Bodie who was explaining this concept. At the time, it seemed obvious what would be the trigger (a slowdown or collapse in housing), even though the exact way it happened (Bear, Lehmen, Default Swaps) wasn’t. I’m not sure what’s going to cause the next recession? I don’t see anything on the horizon. Could be the case that to have the tools in-place to fight the next major recession, the Fed has to effectively “cause” a mini-recession with the rate hikes and asset unwindings. That’s all I can think of. As Luke Gromen says after the dotcom crash the risk was moved onto bank balance sheets. After the mortgage implosion the risk was moved onto the sovereign balance sheets. Now here we are with the Everything Bubble across the globe. What will be the release valve this time?…Fiat Currencies with a writedown of sovereign debt..
My bet for the catalysts is housing + student debt. It’s been obvious to anybody on the ground looking. I just wonder if the mass media will truly highlight the obvious. Great job breaking down the curve in a way that everyone can understand! I’m skeptical that this correction/recession will look the same as the last two. My warning bells are ringing because it seems like a lot of people have the playbook for getting out before the market corrects. A lot of “market does not top until 12-18 months past a yield curve inversion”, with everyone eyeing the same cash markets. However, if you look at the forward markets you will see that OIS, Eurodollar, and global bond indexes have already inverted. We’re also coming from very different stimulus/liquidity levels than the last time. The neutral rate is probably closer to 2.5-3% rather than 5+%. The Fed has less ammo to delay once the data and curve signal a warning. We also have had unprecedented liquidity injections globally over the last decade. Who knows exactly how balance sheet tightening will factor into the cycle. What impact could a trade war escalation have on that timeline now that Yuan devaluation and/or foreign treasury dumping could be in play? It’s possible we see the same pattern of curve inversion, 12-18 months later equities top, followed by recession. However, there are a lot of different moving parts this time. The forward markets are already inverting and there could be a chance we do not see the typical cash warning as well. I agree with your comments Larry the Crocodile. Obviously each stage of the cycle has similarities with the last corresponding points of the cycle phase but they are also unique in themselves. This time it’s always different for want of a better explanation. QE and Trump being what is likely to distinguish the next recession from the last. Also, investors are very focused on a recession and stock pullback where the two may not go hand in hand perfectly. How this plays out will be interesting. Why do you fear a bear market in stocks, bonds or any exchange traded vehicle? I read once that 90% of professional traders are short 90% of the time. The short side is where you can make quick money. Further more – Most investors could fully hedge their entire portfolios with one or two futures contracts using very little money, less than $10,000 -and thus saving themselves from having to gyrate and unwind all their great investments. Don’t sell any investment!!! Hedge it with Futures contracts or any exchange traded derivative that fits. Seek out a Series3 professional expert in the function of hedging. Wow Sam. Thanks for shedding some light on this. Makes perfect sense how you explain it. It is sad to see this amazing bull run on its last legs if this is indeed the case. I enjoyed the article, but it left me with some questions that you did not answer. Hence, I went and did some research on my own to answer them. Q. Is there any data that contradicts your assertion that an inverted yield curve leads to a recession within two years? A. Yes. Japan has had five recessions without an inverted yield curve in the past three decades. Q. Can the curve invert, and there not be a recession? A. Yes. Australia has had four yield curve inversions and only one recession. Q. But we are talking about the United States, and not Japan or Australia. What about in the United States, does an inverted yield curve really predict a recession? A. Since 1968, an inverted yield curve in the United States has predicted a recession within two years. However, from 1935 to 1965, the United States had six recessions without an inverted yield curve. In those cases, the United States was in a low interest rate environment. Also, in late August and early September of 1966, the United States had a brief inverted yield curve, with no recession. Finally, in late 1998, there was a very flat curve, but no inversion or recession. The yield curve finally inverted in 2000, with a recession in 2001. It also looks like that there may be brief times (on the order of days) when the yield curve inverts before correcting itself. But I need to do more looking into the data for that last point. Therefore, an inverted yield curve in the United States looks to be a good leading indicator of a recession within two years, but it is not a guarantee of a recession. I would also look for other data to corroborate the likelihood of an impending recession. Again, this was a very good article. Great research! Thanks for sharing. Another tenet of investing besides everyone being rational long term, is that there are never any guarantees either. One must think and formulate an economic and investment thesis, and invest accordingly. I don’t want people investing blindly and then waking up shocked things didn’t work out they way it did. The more FS readers can get educated, including myself, the better. If I knew all the guaranteed returns, I’d have retired early and become a stay at home dad for the first five years because who has kids and then decides to go to work to pay a stranger to take care of their kids?! Now that would be irrational. The Too Long; Didn’t Read (TLDR) version is that since 1976, there is no monthly data that contradicts your assertion that an inverted yield curve leads to a recession within two years. But the longer answer is a little bit more nuanced than that. I took the 10 year Treasury data and subtracted the 2 year Treasury data since 1976. There is a good correlation between an inverted yield curve and a recession within two years, except for one false positive. That false positive occurred in 1998. As I noted above: “there was a very flat curve, but no inversion or recession”. Technically, the yield curve did invert in 1998, but just barely. On June 25, 1998, the 10 year Treasury was yielding 5.46% while the two year Treasury was yielding 5.53%. That is a minuscule difference of 0.07%. Over the 23 days that it was inverted, that was the largest different while the average of the inversion was 0.03%. You could call it a very flat curve or an inversion, depending on your time scale, and be correct either way. Compare the 1998 data to 2000, when the curve inverted for 8 months with a maximum difference of 0.52% and an average of 0.27%. That is a much stronger signal. Compare the 1998 data to December 2005, when we see a weak signal (and the recession started in December 2007). This was followed by a stronger signal in February and March 2006. A third, very strong signal occurred starting in June 2006 and continuing into early 2007. The takeaway is that if you look on the order of days, and for inversions that are less than 0.1%, then you can find contradictory data. If you look on the order of months and for inversions greater than 0.1%, then the inverted yield curve is a very good predictor. They way I will look at it is that if the yield curve inverts slightly on the order of days, I will move to a cautionary stance, and look for more data. If the yield curve solidly inverts for months, I will still look for more data (I like data), but I will be on the lookout for a recession. Finally, this does raise other questions. 1. Is this a good sell signal for stocks? In other words, could I sell my stocks up to 2 years in advance of the recession, then buy them back, and make money? 2. Would I make enough money to make it worth the effort? 3. Or would it have been better to just hold my stocks the duration? 4. IF this is a good sell signal, then what is the corresponding good buy signal? Did I mention that I really liked your article? It depends on one’s goals and timeline. If I was still aggressively seeking financial independence, I’d just stay as long stocks as comfortably possible until the yield curve inverts and then consider de-risking some, or stop investing in stocks and build as big a cash hoard as possible over the next 18 months now that money market rates are paying a respectable amount, and then if a downturn hits then start legging into the market over a 12-18 month period. As for me, I’ve already de-risked to 55% stocks / 45% bonds and have started building a short-term CD and short-term bond ladder. I feel I will sleep well with this plan in a bull or bear market, so long as I focus on my income generation. Massive net worth growth since 2010 has significantly lessened my greed. Everyone is going to be different. Gotta find your own strategy. Having exposure to commodities will help if we see inflation creep up and really help during a recession. I personally own some bitcoin too because its uncorrelated asset that not only adds diversification but could really outperform in the environment you discussed. Well done Sam! Thanks for this, Sam! This was super helpful. I’ve read other articles on it before and *kind of* understood it, but the chart and you walking us through why the long term and short term borrowing changes really made it sink in. You could be a sessional instructor at Haas and get all those health insurance benefits for the family. Hah, I don’t think I’m qualified to teach despite my Econ degree and MBA. I’m more of a doer, than a teacher. This article took me a long time to write because it was so hard to try and explain in simple terms since finance is so Yin Yang. Why use one indicator when you can use 10? 1. Commercial and industrial loans at commercial banks: a decline indicates recession in progress (currently these loans are growing). 2. Year-over-year decline in stock prices: Recessions follow quickly (not even close to this happening at present). 3. Reversal in the unemployment rate: rate rises more than a quarter point over three consecutive months means recession has probably begun (not now). 4. Corporate/Treasury yield spread. Yield spread between the lowest investment-grade corporate bonds and 10-year T-Bills above 200 basis points is a bad sign (about 170 right now). 5. Copper prices: below $2.50 per pound means a slowdown (currently about $3.50). 6. Freight Transportation Services Index: downward trend changes lead economic slowdowns by an average of four to five months (this just reached a record high). 7. Declining Australian dollar vs. the U.S. dollar: indicates possible slowing global economy (down a little right now, but at .74 it might be okay). 8. Oil price spike: Prices are up again but is it enough? 9. Unemployment: under 4.5% can indicated a recession in 3 years (so around Summer 2020). 10. Inverted yield curve: When long-term rates fall below short-term rates (possibly as early as Summer 2019). But, for those who really like uncertainty, keep in mind that all timelines to a recession are accelerated if we have a big trade war. Timing things presents a problem, obviously. Two percent on a CD doesn’t sound like something you want to do for too long. Inflation eats that up in a heartbeat (and probably more if we really were tracking it). The question being, what do we do inside our retirement plans where CDs are not an option? Move from stock mutual funds to bond mutual funds? What about funds that are in a closed fund (and an extremely good one) that you won’t be able to get back into again? Is it still worth it to avoid a 20-30% decrease that will likely recover within 2 or 3 years? Also, bear in mind (pun unintentional) that stocks and bonds can both crash at the same time. Awesome due diligence! Love it when readers take a step beyond. Laddering into short-term treasury notes (6 month, 1 year) are an option. Gradually raising a bigger cash percentage is an option. And lots more. Mergers, acquisitions, and buyouts: These tend to peak right at market top. But what good is this? Things are already on their way down when these begin to fall off. You could almost just as well say stock prices tend to peak right at market top. Inflation: Erodes profits and weakens consumer spending. Also causes the Fed to raise interest rates which is for businesses carrying short-term debt and also is bad for bonds. But how much inflation is too much? When is it time to jump? Debt: Total debt among non-financial U.S. companies is highest right before a market reversal. This tends to make the companies particularly vulnerable when the economic shock arrives. But this may of much predictive value as we would expect borrowing to increase over a bull market, only to be forcibly curtailed when the correction or recession arrives. Disproportionate Investment in Growth Stocks: During bull markets, investors are less focused on safety and more focused on profit, so the pour money into the companies that are growing most quickly instead of alternatives like value stocks (stocks that are a bargain price or which pay strong dividends). This over investment into growth stocks peaks just before or just after a market top is reached. The obvious problem with its predictive power is that the market may already be in free fall before you can see that investors are shifting out of growth stocks. But let’s not lose sight of the big takeaway from all this. The important thing is to be prepared for ups and downs, not to do massive sells or buys whenever one is close or, worse, already in progress. Peter Lynch managed the Fidelity Magellan Fund from 1977 to 1990, and averaged a 29.2% annual return that more than doubled the S&P 500 index. In “One Up on Wall Street,” he relates how he was playing golf in Scotland when someone brought him word of the crash of ’87. He said his first inclination was to run for a phone. Before he did, he recalled that he had invested soundly and had faith in his selections. He then continued to play his golf game instead. My favorite Wall Street bull, Tony Dwyer, talks about the yield curve inverting incessantly. He stated, its the single biggest predictor of recession there is. However, after the yield curve inverts the stock market usually has positive returns for the next 12 to 18 months. With this being said, what can a investor do to protect themselves? The answer for me is nothing. Reason is I’m not smart enough to know if this time is the same or different. Therefore I do the same thing when the market goes up as I do when the market goes down. I continually dollar cost average into index funds. I’ve done this through the dot com crash, the lost decade, the great recession, numerous corrections, the Asian financial crisis, the S@l collapse, the Greek crisis. You get the point. I have never timed the market, never sold at the highs or the lows. Actually I haver never sold a share in 20 years. This has proven to me to be the best way to build passive wealth over a long period of time. I wouldn’t count on any lead time for this time around. markets today aren’t what they used to be. the specialists are long gone. Much of the trading is pseudo-liquidity provided by the algos. If the computers detect any real selling by institutions then you better believe they will withdraw the bid and probably go short in a heartbeat. When the downleg happens it will come out of the blue. There will be no time for humans to react. A black maw will simply open up below markets as bids will disappear. Limit down like that. markets close for a few. Reopen. PPT tries to levitate markets for awhile but fails. Limit circuit breakers tripped again. Then the real fun begins as closed door meeting commence. Trial balloons float of helicopter money, overt monetary transactions, and collateral guarantees. We humans then look into the abyss and realize there is no easy way out of this central bank quagmire. Goodwillhunting, You could very well be right. You also could very well be wrong. That’s why my strategy works. I do keep 3 percent of my net worth in my fun stock account. That way I can react to different strategies and scratch the itch that people get when turmoil or “irrational exuberance “ occurs. Over time though this account underperforms my boring dollar cost averaging index account. I do the best when I ignore what I think, as well as people much smarter than me think and just keep buying and holding. A lot of wisdom in your words Bill. And it reminds me of the high net worth allocation of those in their 70s+ at 60% stocks. However, I will say with absolute certainty is this: those that have gotten extraordinarily rich quicker than average have placed outsized bets beyond just an S&P 500 index fund. So I do recommend investors take some aggressive bets throughout the course of their lifetimes with ~10% of their net worth. No doubt Sam, I believe that as well. I made my money owning a business. Single best way for a person to strike it rich. Now I’m in in the preservation as well as generational wealth phase of my life. My goal is to pass many millions on to my favorite charity. My hope is that my stock portfolio grows to a point that it continually provides resources for a generation or two. I’ve definitely taken a lot from this great country. I’d like to give some back. Love your outlook to this Bill, refreshing. For someone still in the accumulation phase I need to ask some hard questions. 3 data points (recessions) in the 35 year data set. Not very robust statistically. Logic sound, but a receding (slower or non-growing) economy doesnt de facto mean a decline in stock prices. A longer historical look at stock market returns/recessions shows lower average, but not always negative, returns. And again, a limited data set. Real returns might turn out fine. The yield curve has inverted prior to the recessions preceding the ones in his sample too, although perhaps if we went back far enough it wouldn’t be the case 100% of the time. That being said, if we had to make our best forecast presumably a method based off this data would yield the best predictions. Just thinking about the yield curve going negative, I agree that if there is a linear regression inversion will come around 2020 as stated. We do know though, that forecasts are highly unreliable especially when economics and finance is the source of the underlying data. Just look at ’94 at the above graph and how it just bumbled along until the dotcom bubble burst at the end of the century – that 6 years! Pulling out all the stops and going turtle is a bit too risky – I am steadily decreasing my exposure to the stock market systematically but not all at once. This does not mean that I at all disagree! Knowing that if the inversion is coming, that means longer term interest rates will be lower than short term interest rates, which in my mind, as a real estate investor in metro NY (where prices are more insulated than the rest of the country) is a prime reason to start locking in much lower longer term rates relative where they would be (potentially). Recall back in summer of ’16 at Jackson’s Hole the talk was about going negative and large scale asset purchases. They knew the GFC would reassert itself. All the intervention had only forestalled the inevitable debt deflation. I’m using this pullback in paper gold to scoop up more ounces if anybody is actually selling. I look at my sizable cash allocation and yes, I can get 2% now, but what if they go to negative zone? there was a great chart posted on Twitter showing all the real rates across the globe using official CPI numbers. Even with massaged CPI numbers real rates are negative. Gold should be screaming if real rates are below positive 2%! So, yes, Virginia, the price of gold is manipulated. Good luck with your multi-family property purchase. I’m doing something similar, but with real estate crowdfunding so I don’t have to do any of the work. So far, I’ve got 18 properties around the country, and it feels awesome not to have to do a thing. With short-term CDs, it’s all about cash management. Now is the time to optimize and take advantage. I’m not talking about dumping a majority of one’s net worth in CDs, yet. Yes, it’s totally about cash management! Yields on savings and money market accounts have jumped as well. Vanguard is offering 2.05 percent on its’ prime money market fund, but I want the FDIC to guarantee my investment. Sallie Mae’s money market accounts are at 1.9 percent now. I won’t look at less than 2.5 percent on a one year CD. If you want to go through the hassles of membership, Andrews Credit union is offering 2.75 percent on a 9 month CD. Short term treasury paper is attractive as well. No state income tax on the income, which is a bonus in the high tax states like California. We know the stuff will hit the fan at some point in the not too distant future. You can get 2.8 percent on a two year CD, but my guess is that the rate will climb in the near term. I will only put a small amount out at that yield. Timely article as this has been discussed a lot more recently including some comments by Jerome Powell. I’ve personally always wondered if maybe the Fed should be doing more to prevent economic recessions like in this case putting the plan to raise short-term rates on hold, or in the case of the 2008 financial crisis, cutting short-term rates a lot sooner. Thanks for a very clear and understandable explanation, FS! My interest is as an ‘Investor’, and I follow CD rates as a proxy for the bond examples. Putting the yield curve into practice, nine months ago I bought a 2-year CD at a 1.8% yield. Today, that 2-year CD yields 2.8%. You are still killing it, you are becoming the Cal Ripken, Jr. of PF bloggers! ;-) Continued success to you and all Samurais! Funny you should mention a short term CD, because I just dropped some coin in a 12-month CIT Bank CD yielding 2.5%. It feels so good to actually make a return on cash now! My upcoming post will be about building a CD ladder. No brainer to take advantage now. Why quit when you can keep on going? CR Junior out! Yes, just posted on the ladder. I would agree that there will be better opportunities coming up. Personally with my time horizon I will capitalize with real estate. Those CD ladders will be coming due when it is time to pick up a multi family. As far as stocks go though I am a robot to much volatility to not be. If I “got out” I would be stressed the whole time and would be guessing when to re-enter. 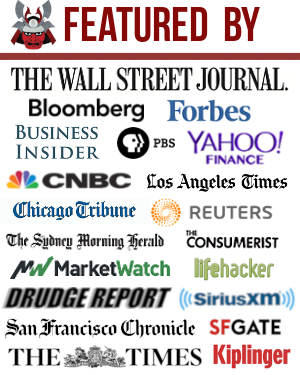 I am just grateful this first bull run allowed me to be in the position I am. I feel like luck and timing are really part of investing. Here’s to being prepared in 2020! Looking forward to your upcoming post about CD ladder! The problem with these kinds of indicators is that if everyone is expecting this, it’s less likely to happen. The economy is a series of feedback loops. Let me put it this way, there are unlikely to be any widely known economic indicators that can possibly be predictive enough as to be actionable, because to the extent that they are, someone is already using them and that in and of itself will change the outcome. I honestly think it’s all a waste of time, all you can do is invest based on the best information you have and your risk tolerance. You’ll never really know whether you were just smarter than everyone else or lucky, maybe not even after the fact. And even if you could figure that out, you may not be able to replicate whatever you did on a go forward basis. True, yet history repeats itself over and over again. It’s like why isn’t everybody rich and financially independent, when it’s a really straight forward formula? All the information is out there, yet people still struggle. I attribute 80% of my investment returns to luck. The 20% is from due diligence and risk taking. At the end of the day, you either outperformed or underperformed. It’s really easy to judge the results. I enjoy a lot of your content, but in my experience luck must play a bigger part than you think. I was always motivated, doing odd jobs at 10 etc… but it has not been straight forward and easy for me, even though I started a regular job at 14, investing at 21-22, (around ’97) I was winging it with no guidance. My family was extremely poor with no $ skills or knowledge. I got de -railed several times by mom and stepdad (My father died at 34 from lymphoma caused by agent orange) due to things beyond my control as a kid, like having to spend the $ I saved for a car before I turned 16 on moving, even though I didn’t want to move. Didn’t end up getting a car until after graduation. In 12 grade I got out early on work release and walked a few miles to work for 2.5 hours at long john silvers, then back to catch the bus at school to get home. Tried to break the cycle by moving to Atlanta by myself with no help or support of any kind at 20. It was depressing and lonely as I couldn’t afford many long distance calls to family and friends at first, had no furniture, and slept on blankets on the floor. (Wish I’d thought to buy an air mattress sooner!) Eventually I got the ball rolling and did ok, started trying to invest etc. Then I was in a bad car wreck. I only had liability so I lost my car and could not work for awhile. Went back to work way before I was supposed to, but my body hasn’t been the same. I temporarily moved back to my parents town and kinda got stuck I guess. It’s in Appalachia, where 3 years experience in a trade might get you $15 an hour if you’re lucky. A few weeks ago the company just shut the doors unexpectedly. We keep taking hits like this here. Finally started investing again this year, and apparently we’re too late! Missed the supposed 8-10 recent bull years in the stock market, barely scraping by, couldn’t even think of investing. I like to think of the abundance that exists and dream of moving somewhere with better opportunities, but it’s been a struggle just to keep vehicles running, food on the table, lights on etc. I’m 44 now and probably won’t have kids because we waited to get in a better financial position. Oh well. Comments like “it’s straight forward and easy” really gut me, because I went above and beyond since I was a kid, and I have a tiny 640 SF shack of a house, a 99 dodge ram with almost 300,000 miles and the door trying to fall off, a hurting body, and I’m discouraged and scared for the future much of the time. I often have to help my now widowed mother too. That said, I try to count my blessings, and thankful for what I have been able to gain or hold onto. Btw, our family received NO compensation about my father, mom is not very good at dealing with stuff like that. I wonder about this myself, especially now that algorithms handle such huge sums of money and definitely will consider the yield curve. That said, maybe start making adjustments a little sooner than you would otherwise so-as to preempt the automatic trading and subsequent panic? We’ve been hearing for a while that this bull market can’t continue and to be ready for an upcoming recession. This is, by far, the best explanation (with visual aids for the financially-impaired such as myself) I have found. I will remain invested and keep investing in the market as I did in 2009 since I have a long-ish horizon. Short term, I am focusing on paying down my liabilities (mortgages) since money isn’t as cheap as it used to be. Keep up the good work Sam! Thanks for explaining this from all the relevant perspectives. Based on the when (i.e., 2020 estimated time frame), what would you suggest to someone still in the accumulation phase or one whose retirement horizon is still 20+ years away? From an investment standpoint, would it be to stock up on cash so you can buy on the cheap when a recession hits? Buy more the lower she goes. Do not panic sell. I will point out that while the yield curve has done a decent job ignoring US market prediction the correlation is not as strong or even non existent in other parts of the world. Ie there is some credence that this time could be different is possible even if it actually isn’t different this time. I’m totally a numbers guy, so I really enjoyed this post. There definitely seem to be a lot of indicators that a recession is on the horizon: it’s been a while since the last one, the stock market hasn’t been as good this year, and, of course, the yield curve you talked about in this post. Of course, the economy will have unlimited growth until it doesn’t, and then everything that caused it to crash will be super-obvious in hindsight. For sure! If a borrower ain’t reading FS or other personal finance sites, banks should definitely charge much higher interest rates! The average American seems to be really struggling versus personal finance site readers. If you want to invest in equities based on history, stay invested and continue to contribute to a balanced fund. There are many things that can move the market and virtually all are caused by the actions of humans. Today we are in the midst of a boom in most everything thanks to common sense leadership, however take note of the enormous effort to derail the good times for political gain. Fringe ideas like raise taxes, open borders, guaranteed income and Socialism are not bothersome to the market unless they become mainstream. Stay the course as long as common sense governing prevails and the fring remains the fring. Graphs do not cause market performance. Graphs are a reflection of what has happened in the past. Probability only works when human behavior is not involved. As to the “experts”, most of their money is made from selling you their ideas. If you have the Goose that lays the Golden Egg, no need to share. Wow you did such an awesome job explaining the yield curve. The three perspectives are super helpful. I used to find the subject confusing but understand it SO much better now. Thank you! Thank you for taking a rational view on the markets. The constant stock market cheer-leading has been a little bit tiring lately, and it seems that many are very excited about new highs. Market has been on crack for a number of years. Even a little bit of a hangover would help normalize things a little, but sometimes after a long night of partying, even more rest is required. We’ve been in a depression since early 2007. Easily seen in fly-over country. Ten years of extraordinary easing by central banks have kept the flighty service sectors of both coasts frothy, but that is ending. A military faction that had enough of globalism refrained from pulling a coup while Obama was in. Instead it took Trump into its fold and have protected him from the jackals that got to JFK. The Anti-globalist faction behind Trump realizes that power comes from production, not military over-reach. Supply chains will be brought home. The days of the US exporting dollars for global liquidity are ending. The exorbitant burden of being the reserve currency will be relieved as the US transitions back to a national economic paradigm. As an investor it’s so very important to be on the right side of history as these changes unfold. This is the most amusing thing I’ve read all year. As someone who is in a particularly risky situation, I’m definitely feeling the stress. I work for a startup in technology consulting. When I first started 18 months ago, there were only 7 of us. Now there are 15, and our revenue has quadrupled, but still much less secure than working for my 70,000 person megacorp. My wife works at a small PR firm with a total of 3 employees. Both of our jobs are vulnerable in a recession. In addition, we just bought a house. Our mortgage is less than $350k, but this has been making me feel the stress. What I’ve done is, instead of rebalancing my existing portfolio, I am preparing by diverting new money into less risky assets — namely cash. My goal is to build up my e-fund to a total of $50k. If my wife and I lose our jobs, this will last us about 12 months, if we take unemployment into account. We could probably stretch that to 15 or 16 if necessary. It also gives us the opportunity to continue investing during a recession assuming our jobs stay secure. Sam, so if you think that a recession is likely in 2020 (which seems very reasonable), what do you plan to do in the next year to protect your investments? Stocks will plummet, but long term bonds are flat, as you indicated. So, what are the precautionary measures people should take to protect their wealth? For the last two recessions I just rode it out and the story ended happily. I know it depends on time perspective (i.e., the time until you need the money), but are there other concrete steps you will be taking? This is my question as well. An article on your concrete steps to protecting your wealth before and during a downturn would be most welcome. Great article, Sam! As a Joe Schmo who is trying to pay down student loan and mortgage while maxing 401(k) and Roth IRA, I would really appreciate an article about concrete steps for a less than wealthy guy to take too! I have little idea whether, going forward, should I be paying of debt rather than contributing? This is the best article I’ve ever read on the subject. I stopped buying property last year and focused on paying down existing mortgages. Will be ready for the next downturn. You see how things are crazy now in small parts of life, that you’d normally not notice them. Looking for a Rolex recently the climate has changed where, many used models sell for more than MSRP because you can’t find them. A few years back this was clearly not the case!